To witness Cycle of a Sari is to be transported to another real, another dimension, another spirituality. Onstage at Toronto’s Annex Theatre, this workshop production is a feast for the senses. It’s an examination of the threads, streams and cycles that run through whatever this thing called “life” is. The Annex Theatre on Bathurst Street is beautiful and the perfect place to mount Cycle of a Sari. It is a small, 150 year old performance space that used to serve as a church. With wooden staircases on either side of the stage and stained glass windows, this venue oozes history and potential. The Cycle Collective takes full advantage of the space and are rewarded with sold out shows. When you enter the cozy 100-seat theatre, Rani (Nisha Ahuja) is suspended by interwoven silks. She hovers above the stage, gently twirling, while Asha (Kumari Giles) lays motionless on the floor below her. To the left are two red silks, gathered in a neat little pile at the same time they are suspended 20 feet or so overhead. To the right are two similar yellow silks. Also overhead are two “streams”. Hung on wires are glass containers, the type of jar one might house a pet goldfish in. The jars contain fruit, flowers and other things that make this world a beautiful place. I thought it was symbolic of floating candles released into a stream to remember a lost friend or family member. Ahuja begins singing, showering Giles with words, flower petals and bits of food. Ahuja unravels an epic tale that involves several continents and generations. Aerial skills and song are the primary techniques employed to share this journey. Sound, shadow play and other elements are used to a lesser extent. The story is about Rani being in limbo for nearly a year after she has died. Her granddaughter Asha has her ashes and is trying to construct new rituals. It’s a story about being divided from what is yours, and being divided from yourself. It’s a play about trying to reunite generations. I thought that the hanging silks were used effectively, as symbols for saris and bonds. Vibrant and beautiful, they flow and bend but are capable of supporting amazing weights. 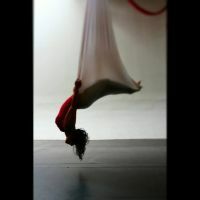 At times Giles uses the silks to perform trapeze-type gymnastics. It was entirely engaging and brought me back to times when I was young and my father brought me to the circus. At just under an hour, the play is short. Rightfully described as a workshop production, I thought that most of what I saw at Cycle of a Sari would be better suited as supplementary to a more thorough narrative. What they accomplished is really amazing, but to me it just seemed like mood setting. This play reminded me of the old Pogues music video Summer in Siam. For a male like me in his 40s, the repetitive nature of the play, repeating something so basic that we all take for granted was a bit like putting in a finishing nail with a sledgehammer. I could have used much more story progression. To me, it seemed a bit like an audition at times, Giles showing off her strength, dance moves and brilliant acrobatics. That being said, it is a very enjoyable performance. In sports parlance, Cycle of a Sari is a good draft pick: it has a huge upside with very little downside. Cycle of a Sari played at The Annex Theatre in Toronto September 5-7, 2014.